I'm proud to be a resident of the Manor Park Neighborhood since 1999 and a homeowner since 2011. I was born in Kingston, Jamaica but grew up in Historic Anacostia. I am the middle child of five siblings, a wife and mother of two beautiful girls. I learned early on how to be a leader and team player in my family and community. As a Committed Neighborhood Advocate, I've seen what we can do when we work together for the betterment of the entire community. We are fortunate to count amoung us many leaders, seniors, young families and small local businesses that deserve enthusiastic professional leadership. Thank you for helping me bring my compassion and energy to the ANC by electing me your next Advisory Neighborhood Commissioner for Single Member District 4B06. Natalee worked with neighbors and local leaders to help revitalize the Manor Park Citizens Association (MPCA). As President of MPCA, in it's first year, she hosted activities that brought the very youngest and oldest residents of the neighborhood together. These activities included: the biggest neighborhood-wide yard sale in DC history, the first Manor Park Holiday Lights Contest, and the first Screen on the Green in Fort Slocum Park. She worked with the Mayor's Office on Aging and became a Seniors Ambassador in her community. She volunteered one day a week to teach an 'Intro to Computers' class at both the Hattie Holmes Senior Center and the Bernice Fonteneau Senior Wellness Center. She frequently holds seminars on 'Decluttering Your Home' and 'Seniors Saving on Their Property Taxes' at her local libraries and community centers. Natalee works as a REALTOR alongside her husband David Snider for the Compass Real Estate brokerage. She is a Neighborhood and Senior Real Estate Specialist. She currently sits on the ANC4B Design Review Committee, addressing issues relating to development, design, historic preservation and zoning. She uses her professional knowledge to advocate for the rights of her neighbors. She was born in Kingston, Jamaica and moved with her family to Washington, DC at the age of five. She attended DC Metropolitan Public Schools, graduating Phi Theta Kappa from the University of The District of Columbia (CC), and proudly served in the United States Air Force as an Information Manager. She will need your help and your Vote to make this community the best it can be. Please feel free to reach her at 202.615.9500 or info@NataleeSnider.com if you would like to help her campaign. An ANC is a non-partisan, neighborhood body made up of locally elected representatives called Advisory Neighborhood Commissioners. They are a unique feature of the District's Home Rule Charter. The Commissioners, who serve two-year terms without pay, are elected at DC Elections in November in even-numbered years (e.g. 2016). The ANCs were established to bring government closer to the people, and to bring the people closer to government. In addition to providing people with a greater say in the matters that affect their neighborhoods, ANCs were intended to end the duplication of effort caused by the proliferation of special advisory groups. There are now 40 ANCs, up from 37 prior to the 2012 redistricting. 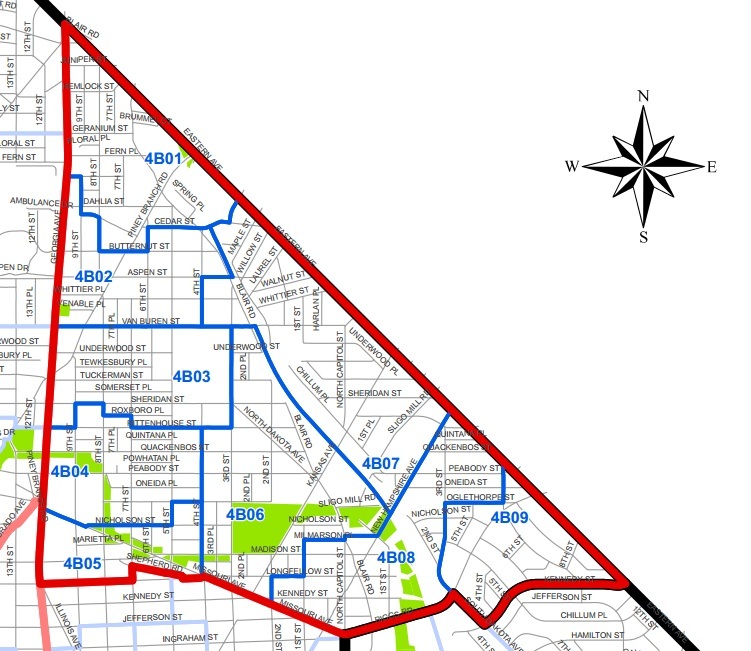 Each ANC area is subdivided into a number of smaller areas. Since only one Commissioner is elected per district, they are called Single Member Districts (SMDs). (The Wards on the D.C. Council are also “single member districts.”) Each SMD consists of about 2,000 people. Although the SMDs should have equal populations, ANCs may vary widely in size. The biggest ANCs have 12 SMDs. The smallest has just 2. As a result of the population growth shown in the 2010 census, the number of SMDs has increased from 286 to 296. The ANCs' main job is to be their neighborhood's official voice in advising the District government (and Federal agencies) on issues that affect their neighborhoods. Although they are not required to follow the ANCs' advice, District agencies are required to give the ANCs' recommendations "great weight." Moreover, District law says that agencies cannot take any action that will significantly affect a neighborhood unless they give the affected ANCs 30 days advance notice. This includes zoning, streets, recreation, education, social services, sanitation, planning, safety, budget, and health services. The ANCs may also initiate recommendations for improving city services, conduct neighborhood improvement programs, and monitor resident complaints. The ANCs began operating in 1976.